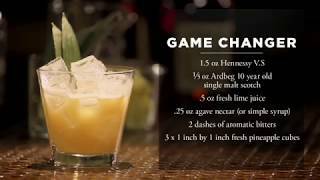 The sweetness of the pineapple, combined with the warmth of Hennessy and Angostura Bitters in contrast to the smokiness of the Ardbeg should remind you of grilled pineapples, a Hawaiian speciality. In a rocks glass add the Scotch Whiskey, very important: use a smoky one, something such as Ardbeg 10yrs. Rinse the inside of the glass with it and dump the excess. In a shaker tin muddle the cubes of pineapple (1x1inch), then add all other liquid with ice and shake until well chilled. Fine strain over ice into the rocks glass. Garnish with two pineapple leaves and grated cinnamon over the top.